Windows fans will be surprised to learn that Apple is working to bring iTunes to the Windows Store later this year. If you want to install iTunes on your PC, then you already know that you have to download the software straight from Apple’s website. This also means that Windows 10 S users are left out of the action completely, since Microsoft’s new OS works with the Windows Store only. Thankfully though, if you make do with iTunes a lot, then there’s good news for you. At its BUILD conference, Microsoft proudly announced that iTunes is coming to the Windows Store and Apple will publish the software by the end of this year. That sounds a little too far off, but it’s a good start from Apple, given that the company has no app at all on the Windows Store. Since it’s iTunes we are talking about here, therefore users will be able to enjoy Apple Music as part of the package as well. Of course, you have to get yourself a subscription in order to listen to some tunes. Furthermore, iTunes will fully feature support for iPhone and iPad syncing as well, so that’s a huge plus. For those who are unaware, iTunes has been available for Windows since 2003. Those are the days when the iPhone didn’t exist at all and Apple was soaring high with its iPod music player. Over time, the company has refined its software in a number of different ways and it stands tall in the position in which it is today. It just remains to be seen whether or not Apple’s move into the Windows Store will come attached with a handful of surprises. For instance, a brand new UI would be an icing on the cake for the overall user experience. Or maybe, just for once, Apple’s music management software on Windows will shed all the usual bugs to become the most stable thing on the planet. 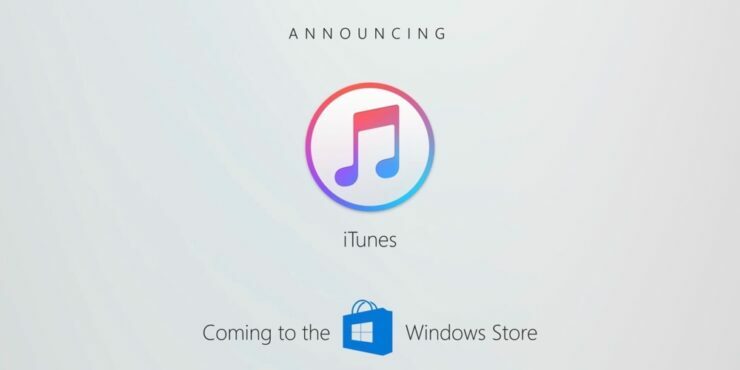 Guess we will only properly know for sure when iTunes becomes available on the Windows Store.